Peel & Place Metal Dome means the metal dome can be easily Peeled off from release liner and then Placed on printed circuit board, flex circuits, or membrane switch. 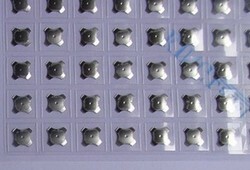 The metal dome is on a pressure sensitive double sided adhesive PET sheet (array), with a release liner/backing. Using this way, people don't need to add extra ahesive tape on the surface of metal dome, in order to fix it on circuit board, or membrane switch. Also with the location hole or outline, the alignment of dome become more easy, which accelerate assembly speed and save a lot of money. In fact, in our company, this the same as our " Metal Dome Array". We named it different because viewing it from the packing purpose. 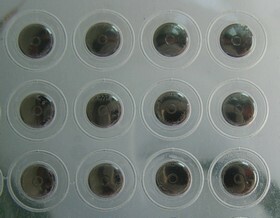 If there's only one metald ome one adhesive array with fixed size, then we named is "Single key dome array", "Individual dome array", or "Kiss-cutt dome array" . 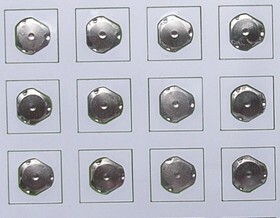 Eeach single metal dome is in the center of kiss-cut adhesive square or circle, with release backing which is easily peeled off. You just tell us the size, color, thickness of dome array, and metal dome parameters, we canl make it for you. Now, all of our Circle, Four-leg, Triangle and Oblong series metal dome can be supplied in this peel & place packing, whatever there's only single dome, or dozens of domes. Please contact us for more information about peel & place metal dome!